In March this year, and as part of their annual conference, I was asked to run a Taster workshop for leaders in the Cornwall and Isles of Scilly PCT. The venue for this gathering was the Eden Project, an iconic organisation which symbolises renewal, forward thinking and care for the environment. There are obviously logistical issues in organising events for areas such as the South-West, where populations are far-flung and an easy-to-reach location for all is essential. But what made this choice so much better than an anonymous city-centre hotel? In my long experience in people development, off-site training, in any venue, frees the body and mind from the ambience of the normal workplace where the participant is subject to “I’ll just check my e-mails” syndrome, or the “I know you’re on a course, but…” interruption from colleagues. To arrive at a place such as the Eden Project on a scintillating, crisp spring day lifted the spirits and raised the bar for unhindered thinking to an even higher level. To be surrounded by beauty, nature and adventurous achievements cannot fail to inspire. On this particular occasion also, the inspirational leadership of Tim Smit (founder of the Eden Project) made easy links to Resilience, with his “can do” attitude in the face of the seemingly impossible; the emphasis on team work and collaboration; and the commitment to change and challenge. Let’s not forget either, how good such an environment is for improving the well-being of our most important resource, our staff. 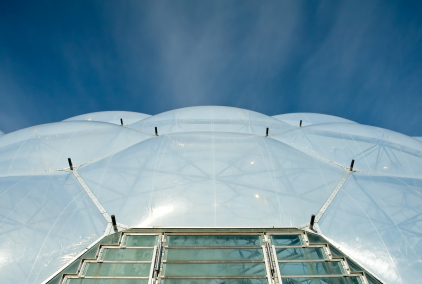 Venues such as the Eden Project often seek to widen their sources of income and competitive deals can often be negotiated, so it’s worth exploring unusual venues in your area. When I round off my workshops, I often ask delegates: “What have you put in your tank today?” I suggest that a day spent at one of the many wonderful places in our regions will top up your tank for many miles to come and add va-va-voom to your performance.